It seems I had planned this trip in my dreams a hundred times. Spending a week in Provence, France, with my husband, seeking the hidden village of Gordes, the ochre hills of Roussillon, the reflecting canals of L’Isle de la Sorgue, When we reached these places that we’d read about in magazines and newspapers, we hoped for a glimpse of Cezanne or Van Gogh painting in the sunshine. Maybe they could offer me some tips. Sitting by the roadside, staring at Mont Saint Victoire, watching how it catches the light, I tried to capture that magic with my watercolors. In Saint-Remy, Looking out the window of what once was an asylum, we tried to spot Van Gogh’s HAYSTACKS on the hill. In Cagnes sur Mer, where Renoir lived the last ten years of his life, the view of the Mediterranean was as close to heaven as you can be. Eventually we reached Paris. For an impressionist artist such as myself, the main activity in Paris is visiting Museums. Knowing The Philadelphia Museum of Art was opening a Renoir Landscape exhibition, I decided to track down the locations that had inspired Pierre-Auguste Renoir. After much research, I found the city of Chatou, which became the highlight of our trip. We had read the history of the masterpieces, which led us to the Restaurant de La Maison Fournaise on an island outside of Paris, where the impressionists had congregated to paint along the Seine. Toting art supplies on the Metro, we crossed Pont Neuf and followed in Renoir’s footsteps to this treasured spot where he painted his masterpiece Luncheon of the Boating. 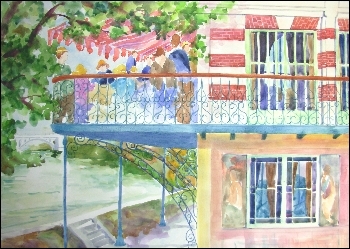 Set on the river bank, surrounded by flowers and trees, “The Restaurant Fournaise” appeared in front of us looking as though it had jumped off the walls of the Art Museum. We blinked our eyes and saw Lunch at the Restaurant Fournaise, with the Skiff in the background. We closed our eyes and saw it as it must have been more than 100 years ago. The Ochre color stucco used to set off brick trimmed windows, were the same as other painters had captured them. The striped awning has been replaced but allows memories to come alive. My husband and I walked along the quay imagining the sailboats in “Springtime in Chatou”, the vacationing Parisians, umbrellas shielding women from the sun, reflections on the water. I could hardly pull myself away. How far we had traveled to meet Renoir face to face. A week later, gazing at the landscapes in the Renoir exhibition didn’t know where I was, in the Museum or in Chatou.